Newly elected conservative politicians have decided to propose a moratorium on earmark spending; an excellent idea. Other politicians claim banning earmarks won’t make a dent in the federal debt. But Obama, who promised to provide more transparency in government spending, made it a big deal in April when he demanded government agencies to cut $100 million out of the budget in 90 days…while earmarks amount to more than $15.6 billion so far this year. Where were these politicians who claim earmarks aren’t that much money when Obama was cutting his paltry $100 million to much fanfare? Earmark spending is when a politician won’t support (i.e. vote for) another politician’s bill unless he gets some money for his vote. The money he gets is added to the bill, and goes to some project in his hometown so when he goes home to run for re-election, he can point to all the money he bribed from other politicians for his vote and spent in his hometown. You would think if Obama and the Democrats were so excited about cutting $100 million from the debt, they would be exuberant about cutting $15.6 billion, and yet politicians on both sides are whining about the loss of their beloved earmarks including the usual suspects like Nancy Pelosi and Harry Reid who get really excited forcing you to co-sign on all their debt spending. Politicians know that if they don’t support this moratorium they are sending the message to all of us that they are not serious about reducing the size of government and that they believe in a process that is basically legal bribery and blackmail and supporting that won’t look very good for them. 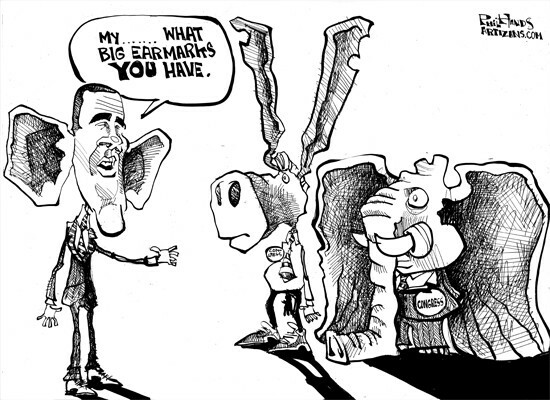 And let’s not forget that since the campaign trail in 2008, Obama has publicly announced his support of earmark reform no less than four times, as seen here. However, as is typical in politics, what a politicians says on the campaign trail and what a politician does once in power are two different things. Obama talked a lot about earmark reform, but did little to make any of it happen. The truth is, too many Democrats and RINO’s loved their earmarks, and Obama didn’t want to take it away from them, so he told us one thing, but did another. Obama had to lose control of the House to be forced to make good on his years of rhetoric and no action. ‹ Unexplained Missile Launch off California Coast?